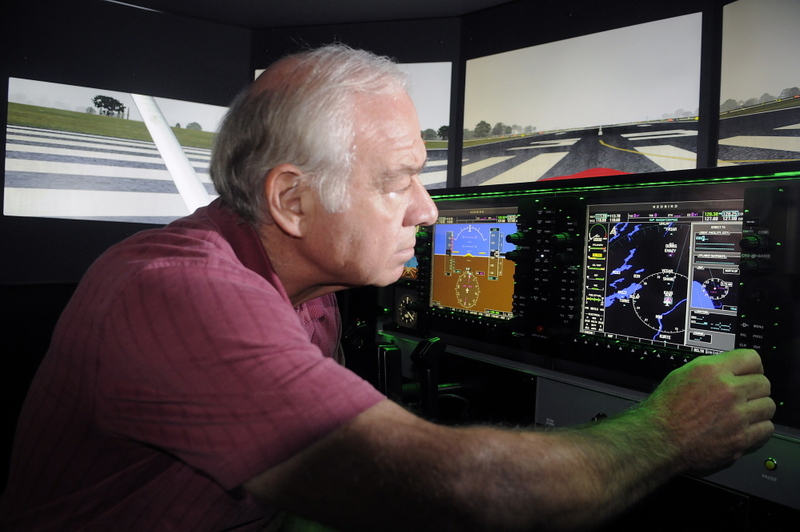 The University of Maine at Augusta bought a state-of-the-art flight simulator to let students practice realistic flying without having to leave campus or the ground. AUGUSTA — Without leaving their classroom at the University of Maine at Augusta, aviation students can take off in Augusta and land in Waterville’s airport in 15 minutes. Actually, using the university’s new state-of-the-art flight simulator and trainer, students can practice flying from any airport in the world, crossing the country or the globe. “It provides a lot of added realism to the flight training,” said Greg Jolda, UMA’s aviation program coordinator. 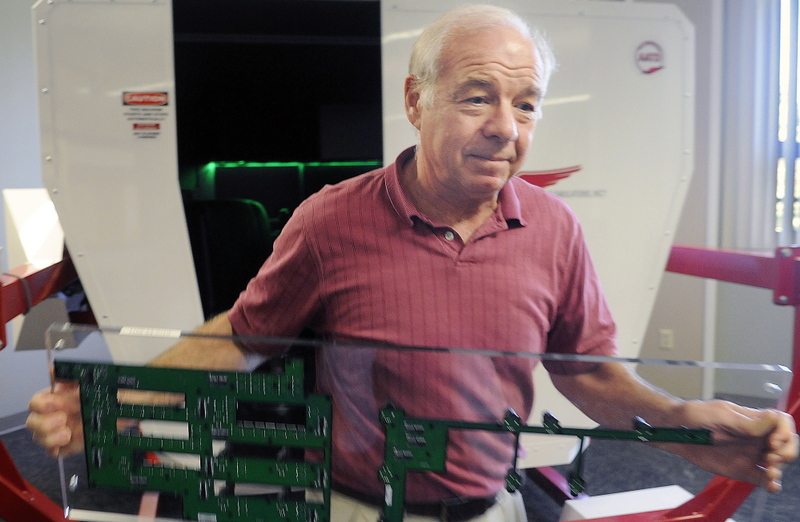 The full-motion Redbird FMX flight trainer bought this summer by UMA is one of only two in the state, the other being at Sanford Seacoast Regional Airport, Jolda said. The university began its four-year bachelor’s degree in aviation, the only one in the state, last year and has more than doubled the number of students in the program this year. The simulator will be used to supplement the students’ flight training and as a teaching tool. Instructors can control the condition of the weather simulated in the machine and even throw challenges at students by disabling one of the plane’s engines, Jolda said. The students also can watch videos of their flights which allows instructors to critique their work. Jolda described it as “a less pressure-packed introduction to instrument flying” compared to an actual plane. Inside the nearly 7-foot-tall machine are two seats in front of the control panel. Video screens wrapping around the cockpit show the view of the outside, looking like a slightly dated video game. The entire machine can rumble with simulated turbulence, providing students with “a lot of added realism to the flight training,” Jolda said. Jolda, a former Air Force pilot with 20 years and 3,000 flying hours under his belt, took a Kennebec Journal reporter on a simulated flight Thursday afternoon from the Augusta State Airport to Waterville’s Robert Lafleur Airport, navigating through clouds for most of the nearly 20-mile simulated trip. “And that’s it. Welcome to Waterville,” Jolda said, after a simulated landing of the single-engine aircraft on the runway. In its first year, the program had 12 students in its first-year private pilot courses and four students in the second-year instrument courses. Nearly 40 students began this fall in the program at different stages, Jolda said. Graduating students will earn a bachelor of science degree in aviation and all the U.S. Federal Aviation Administration ratings and certifications to be a commercial pilot. Students still will need to fly the required number of hours to become pilots for the major airlines, but having the bachelor’s degree cuts that down from 1,500 hours to 1,250, Jolda said. Tom Abbott, a consultant for special projects and accreditation at UMA, said all major airlines prefer pilots with bachelor’s degrees as well. Besides other commercial pilot work, students can go on to become pilots for the military, Jolda said. The university partnered with Maine Instrument Flight to launch the program last year. UMA has a professional services agreement with the flight school at the Augusta State Airport to provide the facilities, equipment and flight instructors for the program, said Abbott, who retired last year as the dean of libraries and distance learning at UMA. He said the program is on an aggressive growth path with plans to add 15 to 16 students each year. The university bought the simulator, which cost nearly $100,000, using reserve money with a plan to pay it back in five years with user fees, Abbott said. The fees for the students are built into the cost of the program for them, he said, but commercial pilots also will use the machine to do their required practice. 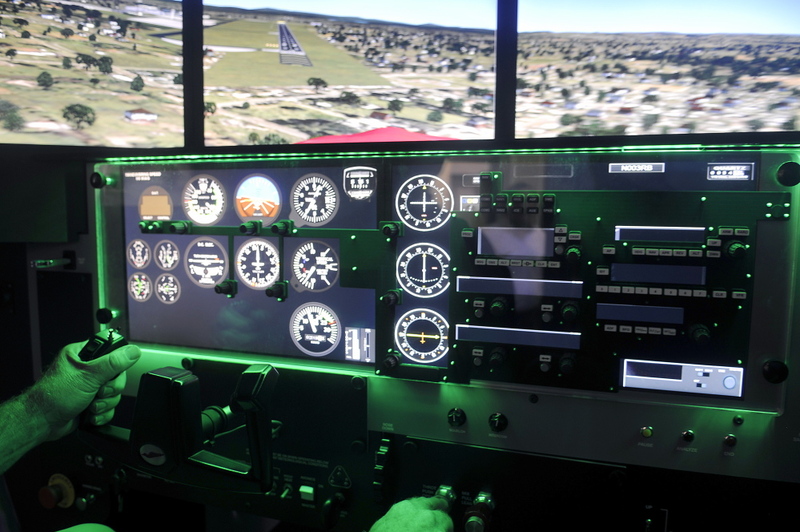 Time in the simulator can be used for the required training hours for students as well.